were even bigger you know more stuff, I had one when i was little and don't rememberwhat ever became of it. so any how does anyone remember these,? and you you haveone please post a photo if your able. and what was the name for this knife. lets do a lil history piece here. i guess this is americas answer to the S,A,K? I had one handed down to me from my Sister. It's made by palco, boy scout knife. thanks XJ i sent a photo to post up so folks can see it. i do remember seeing a number of these over time some smaller some bigger. if my memory is correct the one i had had a reddish/brown leather sheath with small studs on it. I remember those. I camped with one... once. Boy that thing was heavy and cumbersome. But I guess it was the precursor to the Leatherman and Gerber multitools. was very heavy in most areas, tents sleeping bags cookwear. and yes those knives. today it's mre's freeze dry mountian house, titanium cookwear feather weight everything. and if you got dough a diesel motorhome with all the comforts. Man that mil surp cotton sleeping bag and tent stunk. I had one of those when I was a kid. I think I threw it away. Related perhaps, I also had a Spork and gave that away. 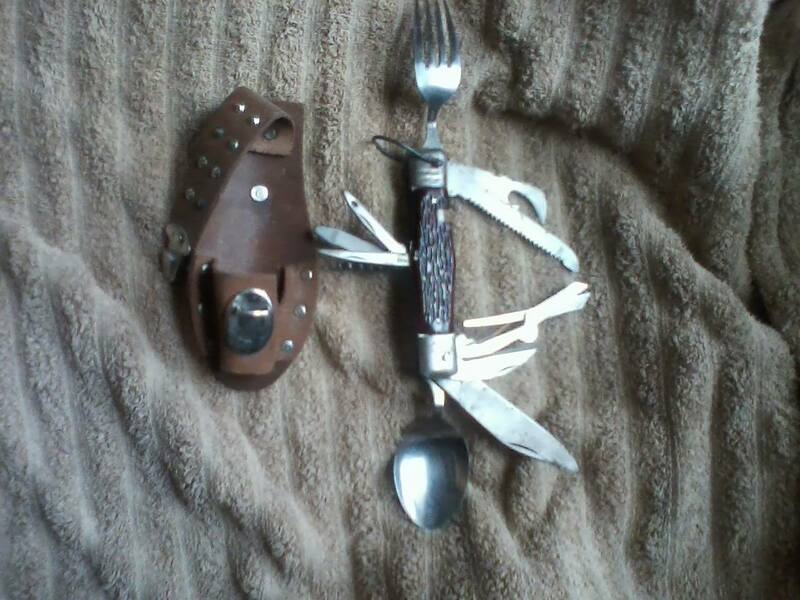 I preferred chopsticks, SAK (or other multi-tool) and fixed blade knife. Run of the mill bamboo chopsticks come in handy for other tasks, and are very lightweight.